This article by Gerard O’Brien and Jon Opie appeared in The Self in Neuroscience and Psychiatry (2003). This is a draft version of the article dated 2000, but it is an excellent and interesting read - and their theory on self and consciousness is not dissimilar to that of Hubert Hermans' Dialogical Self Theory (see also Dialogical Self Theory: Positioning and Counter-Positioning in a Globalizing Society  or Handbook of Dialogical Self Theory ). One of the most striking manifestations of schizophrenia is thought insertion. People suffering from this delusion believe they are not the author of thoughts which they nevertheless own as experiences. It seems that a person‘s sense of agency and their sense of the boundary between mind and world can come apart. Schizophrenia thus vividly demonstrates that self awareness is a complex construction of the brain. This point is widely appreciated. What is not so widely appreciated is how radically schizophrenia challenges our assumptions about the nature of the self. Most theorists endorse the traditional doctrine of the unity of consciousness, according to which a normal human brain generates a single consciousness at any instant in time. In this paper we argue that phenomenal consciousness at each instant is actually a multiplicity: an aggregate of phenomenal elements, each of which is the product of a distinct consciousness-making mechanism in the brain. We then consider how certain aspects of self might emerge from this manifold substrate, and speculate about the origin of thought insertion. To get a feel for how bizarre this is, contrast thought insertion with the experience of hearing voices. The standard explanation of such auditory hallucinations is that the voice the schizophrenic ―hears‖ is actually inner speech which has been mis-identified as emanating from someone else. The error, in this case, is comprehensible: we‘ve all had the experience of being uncertain whether the noise we just heard was real or imagined. Thought insertion, on the other hand, is not a case of mistaking an introspection for a perception. Those who suffer with this delusion are quite aware that the thought has arisen in their own minds. But despite this recognition they still disown it: the thought doesn‘t have any "my-ness" attached to it. Given this symptomatology, it is not surprising that the working presupposition of most current research in this area (and the organising theme of the current volume) is that schizophrenia is, at least in its delusional form, a disease of the self. Despite this focus, what has not been sufficiently appreciated is how radically schizophrenia challenges our assumptions about the nature of the self. Crucial to being a human self is the possession of a certain sort of inner life, one which encompasses a distinction between one‘s own thoughts, feelings, and actions, and the world in which one is embedded. Conventional wisdom has it that this kind of self-consciousness is a unitary faculty, and, moreover, one that is of a piece with phenomenal consciousness in general. However, by demonstrating that it is possible to be aware of the boundaries of one‘s mind without acknowledging that all of the thoughts contained therein are one‘s own, the delusion of thought insertion suggests that this traditional conception of self-consciousness actually conflates two quite distinct capacities. The first is the brain‘s capacity to distinguish its mind from the rest of the world. This capacity produces a sense of subjectivity: an awareness that certain thoughts, perceptions and feelings comprise the mental life of a single psychological subject. The second is the brain‘s capacity to distinguish between self-initiated thoughts and actions, and mental occurrences of which it is merely the passive recipient (e.g., perceptions). This capacity produces a sense of agency: the brain‘s awareness of itself as the source of the thoughts and imaginings that occur within its boundaries. Thought insertion demonstrates that these two capacities can come apart: schizophrenics afflicted with this delusion believe that they are not the agents of some of the thoughts contained within their own minds. From this perspective, schizophrenia would seem to be a disease that undermines a person‘s sense of agency, while leaving their sense of subjectivity intact. The distinction between theses two kinds of self-awareness, and the fact that they can be selectively impaired, means that it is no longer possible to talk of our experience of self as though it were a single, monolithic entity, and hence assume that there must be a single, all-encompassing explanation which does it justice. For example, the facts that explain the brain‘s capacity to draw a distinction between its mind and the world must be different from those which explain its capacity to represent itself as a cognitive agent. Furthermore, because subjects can experience certain thoughts and yet disown any agency in respect of them, the different aspects of selfhood would appear to be achievements over and above the brain‘s capacity to manufacture individual conscious experiences. 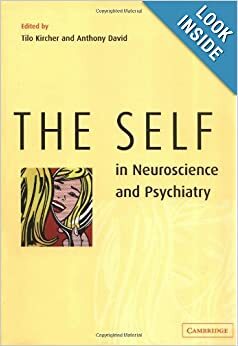 In schizophrenia, in other words, we have a vivid demonstration that the self is a complex construction of the brain that is to some degree independent of its capacity to generate consciousness. We would go further. We believe that schizophrenia offers a unique window on the cognitive operation of the brain. It reveals a relationship between the structure of consciousness and the brain‘s cognitive machinery that is very different from the conception which has dominated our thinking for centuries. Most theorists in this area, either explicitly or implicitly, endorse the traditional doctrine of the unity of consciousness, according to which a normal (intact) human brain generates a single consciousness at any instant in time (rather than several distinct consciousnesses), and hence a single stream of consciousness over time (rather than parallel tributaries). However, what we know of schizophrenia suggests that, far from being a unity, phenomenal consciousness at each instant is actually a multiplicity: an aggregate of phenomenal elements, each of which is the product of a distinct consciousness-making mechanism in the brain. We will call this, for reasons to be explained shortly, the multi-track model of consciousness, by contrast with the single-track model that is implicit in the doctrine of the unity of consciousness. Our aim in this paper is to make good on these claims. We begin by introducing the multi-track model of consciousness, partly by contrasting it with its more conventional (single-track) counterpart, before considering the evidence for this model. We go on to consider how some aspects of self might emerge from the distributed and manifold substrate of consciousness, and enter into some speculations as to how the failure of this emergence gives rise to the symptoms of schizophrenia. Many if not most contemporary theorists working in the field of consciousness studies endorse the doctrine of the unity of consciousness. According to this doctrine, the intact human brain produces a single consciousness at each instant, as opposed to several distinct consciousnesses. Here we argue that this doctrine is mistaken: far from being a unity, phenomenal consciousness is actually a multiplicity. Before proceeding, however, we must provide a clearer picture of what the supposed unity of consciousness entails about the way the brain makes consciousness. 2.1 What does the unity of consciousness entail? At the outset let us quickly dispense with a naïve, albeit influential, understanding of the unity of consciousness. Some would have it that consciousness is a unity because it is a serial stream comprising a single informational content at each moment (see, for example, Penrose 1989, p.399). Like a solo chorister, who, by virtue of the limitations of the human vocal folds, can only produce one note at a time, consciousness is taken to be single-voiced or monophonic. This reading of the unity of consciousness can hardly be sustained. Even the most casual inspection of instantaneous conscious experience shows it to contain contents drawn from a number of different modalities. Sound and vision, for example, don‘t compete for a place in awareness; both are simultaneously present. You may not be able to simultaneously react to, or focus on, disparate sources of experience, but the phenomenology they generate can certainly co-occur. If we suppose that consciousness incorporates a number of distinct contentful elements at each instant, then it is best likened to polyphonic choral music. Musical polyphony involves two or more simultaneously active voices, such that at any moment there are a number of different notes being sounded. We think it is safe to say that most theorists regard moment by moment consciousness as informationally polyphonic. However, a question immediately arises for an advocate of the unity of consciousness: If consciousness is polyphonic, in what sense is it a unity? The unity on offer can‘t be the unity of an undifferentiated whole, because, by assumption, experience is actually a composite structure: it is assembled from numerous contentful elements that have been fused together in some way. The polyphony of consciousness entails, therefore, that any proponent of the traditional doctrine of the unity of consciousness is committed to there being a single consciousness-making mechanism or process in the brain, whose task it is to bind these different contents together into a unity. On the one hand, the task of combining multiple representational contents in a single experience must be performed by some physical mechanism or process. And on the other, if we suppose that the brain implements more than one such mechanism or process, then it must be capable of simultaneously generating more than one experience, contrary to the unity doctrine. Given this constraint, there appear to be only two roads open to the advocate of a polyphonic, but unitary consciousness: 1) treat conscious experience as the product of a single, central neural system where informational contents must be re-presented to be made conscious, or 2) opt for a somehow unitary consciousness-making process that acts simultaneously on the brain‘s many distinct information processing sites. A representative example of the former approach is Baars‘ "Global Workspace" model of consciousness (1988, 1997). Baars begins with the premise that the brain contains a multitude of distributed, unconscious processors all operating in parallel, each highly specialised, and all competing for access to a global workspace – a kind of central information exchange for the interaction, coordination, and control of the specialists. Such coordination and control is partly a result of restrictions on access to the global workspace. At any one time only a limited number of specialists can broadcast global messages (via the workspace), since different messages may often be contradictory. Those contents are conscious which gain access to the global workspace (perhaps as a result of a number of specialists forming a coalition and ousting their rivals) and are subsequently broadcast throughout the brain (1988, pp.73-118). In support of this model, Baars claims there is a brain structure suited to the role of workspace, namely: the Extended Reticular-Thalamic Activating System (ERTAS), which includes the reticular formation, the thalamus, and the "diffuse thalamic projection system" (p.124). The ERTAS is particularly suited to the role of "global broadcaster," given the bidirectional projection system that it incorporates. Moreover, there is "evidence of a feedback flow from cortical modules to the ERTAS" and of global information feeding "back into its own input sources." Baars suggests that "[both] kinds of feedback may serve to strengthen and stabilize a coalition of systems that work to keep a certain content on the global workspace." That is, given the competitive nature of access to consciousness, "a circulating flow of information may be necessary to keep some contents in consciousness" (p.134). This kind of model provides an explanation for the unity of consciousness, because the ERTAS acts as an executive composer and broadcaster. Its role is to combine a number of distinct contents hailing from different sense modalities into a single work, which it then broadcasts polyphonically. The unity of consciousness, on this story, is not imposed by the seriality of the stream of contents broadcast (as would be the case with a monophonic executive), but by virtue of there being a single broadcasting mechanism. Damasio here explicitly repudiates the central theatre model, and builds his account around the known parcellation and distribution of information processing in the brain. What brings content-bearing activity to consciousness is its temporary enhancement as a result of time-locked co-activation with contents coded elsewhere in the brain. Time-locking "integrates" contents coded at "geographically separate sites," which are then capable of simultaneously entering consciousness. Time-locked enhancement is thus a candidate for a single consciousness-making process. This putative process occurs simultaneously at many separate sites, and is unitary in virtue of being phase-locked, or falling within a single well defined temporal window of some kind. It is reasonable to ask whether such approaches to consciousness are the only option. Once it is acknowledged that instantaneous consciousness is polyphonic, and once this fact is considered in the light of the parcellation of information processing in the brain, an alternative way of thinking about the relationship between the structure of consciousness and brain activity clamours for attention. Instead of requiring that the multiple contents of moment by moment experience be re-presented in some central system, or that they be integrated in a single global process, why not suppose that these contents contribute to instantaneous experience via multiple mechanisms of consciousness-making scattered across the brain? We can‘t resist employing another musical metaphor here to clarify this alternative polyphonic model of consciousness and to distinguish it from its more orthodox counterpart (see O‘Brien & Opie 1998). Before the advent of modern studios the only way to record music was to get all the musicians in a room together, place a microphone in their midst, and start up the band. The signal from the microphone would then go through a limited amount of processing before leaving a groove on a wax disc, or more recently, a magnetic trace on a tape. Such a recording is said to be single-track, since there is no way to separate out the individual contributions of the musicians—they are packaged into a single structure. By contrast, on a multi-track recording one or more separate tracks is devoted to each musical instrument. As a result, while all the musical parts combine to make up the total sound during playback, at the level of the recording one can distinguish between them. The polyphonic models surveyed thus far are all single-track theories of consciousness. Whether one treats conscious experience as the product of a single, central neural system where informational contents must be re-presented to be made conscious, as in Baars‘ account, or whether one opts for a unitary consciousness-making process that acts simultaneously on the brain‘s many distinct information processing sites, as in Damasio‘s story, one assumes that at the level at which it is made by the brain, instantaneous consciousness is a single thing. When it comes to consciousness-making, the normal brain has just one track. By contrast, a multi-track theory of consciousness regards instantaneous consciousness as being made up of a number of parallel tracks: a collection of phenomenal elements, each generated by a distinct mechanism in the brain. It might be objected that information in one sensory modality sometimes influences the content of experience in another. A salient example is the McGurk effect, whereby what subjects report hearing is partly determined by what they see. This looks problematic for a multi-track account because the various parts of the polyphonic mix don‘t appear to be truly independent of one another. But the multi-track account is committed only to the claim that the various parts of experience are generated locally, at the very sites where their information contents are fixed. This does not require content-fixations to be completely causally independent of one another. At any given moment there are presumably all sorts of influences, both intra-sensory and inter-sensory, criss-crossing the brain, such that conscious contents not only co-occur, but mutually influence and shape one another. Such causal links are perfectly consistent with the multi-track model, so long as the consciousness-making mechanisms themselves are manifold and localised. The distinction between single-track and multi-track approaches to consciousness is not well-appreciated in the literature. Because of their unquestioning allegiance to the traditional doctrine of the unity of consciousness, most theorists don‘t even entertain the possibility of a multi-track theory. As a result they overlook what we think is a more parsimonious account of consciousness, one that is more consistent with both our moment by moment phenomenal experience and our neuroscientific understanding of the mechanisms subserving cognition. In the next subsection we examine the evidence, both phenomenological and neuroscientific, in favour of this alternative approach to explaining how the brain makes consciousness. Consider, first, the phenomenological evidence. Close attention to instantaneous experience reveals it to be a complex aggregate of many elements. Right now, for example, as you concentrate on these sentences, your phenomenal experience is a very rich, comprising: visual experiences (the shapes, textures and colours of these sentences, together with other objects in the room), auditory experiences (noises from outside the room), tactile experiences (the chair pressing against your body), proprioceptive experiences (the position of your limbs), and understanding experiences (what these words and sentences mean), to name a few. These parts are relatively independent, because they can be altered or lost without substantially affecting the others (try closing your eyes for a moment); like the parallel tracks on a multi-track recording, the loss of any one mode of consciousness merely reduces the total "sound." This independence among the parts of experience is even evident, to some extent, within modalities. Consider the figure below. 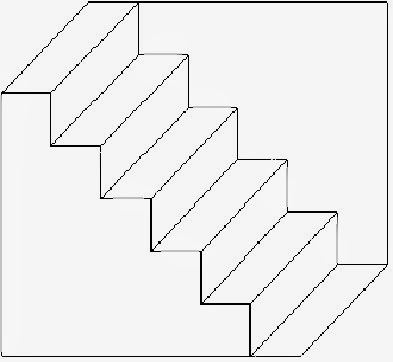 It can be seen as a flight of stairs in normal orientation, with rear wall uppermost; as an inverted flight of stairs, with front wall uppermost; or even as a flat line drawing, with no perspective. And whichever of these interpretations one adopts, the details of line and colour remain the same. That is, our experience here incorporates not only lines, and regions, but also some abstract phenomenology (a sense of perspective) which is subject to a degree of voluntary control. What is striking here is the looseness of fit between the more abstract and the more concrete parts of experience. It seems that, like a sound engineer, we have some capacity to control which parts go into the mix, and how they will sound. Although this evidence is suggestive of the multi-track model, it is strictly speaking equivocal where the single-track/multi-track distinction is concerned. The case for multi-track polyphony starts to look quite compelling, however, when these phenomenological data are combined with a range of neuroscientific findings. Neurologists have long studied the experiential consequences of brain injury. They observe complicated patterns of ablation and sparing, both across and within modalities. It is possible, for example, to lose the capacity to visually detect (or experience) motion, while retaining other aspects of visual experience (Zeki 1993, p.82), or to lose colour sensations, while retaining visual form and motion experiences (Sacks 1995, pp.1-38). Phenomenal deficits of this kind are now known to be the result of lesions in specific parts of the brain. Lesion studies have, in fact, been instrumental in establishing the degree and kinds of functional specialisation and localisation in the brain. The picture that is emerging is of a brain which divides and conquers, with broad divisions among modalities and task domains reflected in large-scale anatomical divisions (e.g., primary visual processing in occipital cortex, auditory processing in temporal cortex, planning and working memory in frontal cortex), while more fine-grained functional distinctions are reflected in correspondingly restricted anatomical divisions and loci (e.g, visual motion detection in area V5, colour processing in V4). Other kinds of studies, such as fMRI, PET, micro-electrode and ERP, which are effective over a wide range of spatial and temporal scales, have lately confirmed and enriched this picture with regard to both normal and abnormal function. The following picture emerges: pathological losses of phenomenology are associated with brain lesions at specific sites, while transient but related alterations in experience (caused by changes in input or task demands) are found to co-vary with activity at these same sites. Thus, variations in conscious experience appear to march in lock-step with reproducible, physically localised variations in brain activity, variations, moreover, at brain sites where the relevant informational contents are thought to be encoded. From here it is a short step to the following conclusion: the brain sites that code for particular informational contents are the very sites where those contents are made conscious. Since the contents and associated brain loci are multiple, phenomenal consciousness is multi-track. A further, tantalising, piece of evidence for the multi-track model has recently been discovered by Zeki and Bartels. They discuss experimental work on visual processing that suggests that when the different attributes of a visual scene are presented simultaneously, these attributes are not perceived at the same time. It appears that colour is perceived before orientation, which in turn is perceived before motion, the difference between colour and motion being about 60-80 ms (Bartels & Zeki 1998, p.2329). Experiments in which subjects are asked to pair two rapidly alternating states of two attributes (e.g., a bar with two possible orientations and two possible colours), reveal systematic misbinding of attributes relative to their actual time of occurrence (Zeki & Bartels 1998, p.1583). This suggests to Zeki and Bartels that there are "multiple visual micro-consciousnesses which are asynchronous with respect to each other" (p.1584), which in turns leads them to advocate a multi-track theory: "consciousness is not a unitary faculty, but…consists of many micro-consciousnesses" (Bartels & Zeki 1998, p.2327). The upshot of all this is that the multi-track model of phenomenal consciousness has to be taken quite seriously. It is consistent with the phenomenological and neuroscientific evidence, and doesn‘t succumb to any obvious a priori objections. Rather, this model appears a viable alternative to current single-track orthodoxy. One area where abandoning the traditional doctrine of the unity of consciousness has major ramifications is in our understanding of the self. Single-track theorists typically explain how the brain constructs a self by deploying exactly the same resources they use to explain the generation of conscious experience. From this perspective, the self and its experiences represent a package deal: the very existence of the latter presupposes the existence of the former. This is part of the "conventional wisdom" to which we alluded in the introduction. But it is wisdom that is put under pressure by the symptoms of schizophrenia. Schizophrenia, in its delusional variant, is a condition that impairs some aspects of self-consciousness while leaving others intact. In particular, sense of agency can come apart from sense of subjectivity. This suggests that the self, when all is well, is a complex entity constructed out of independently conscious parts: a multiplicity, not a unity. In this section we briefly discuss these implications of the multi-track model of consciousness for the nature of the self, and examine some recent speculations about the neurological basis of schizophrenia which support this perspective. According to the multi-track model, conscious experience is not unitary; it is a complex amalgam of co-conscious elements, each generated by a distinct consciousness-making mechanism somewhere in the brain. If one adopts this perspective then it is no longer possible to regard self-consciousness as the product of a centralised workspace, or of a single global process such as time-locked co-activation. Consciousness ceases to be a package deal as far as its neural realisation is concerned — there are as many independent physical loci of consciousness as there are distinct information processing paths in the brain. This means, of course, that our conjectures about the degree of parcellation of self-directed experience are answerable to the neurocomputational facts. But the symptoms of schizophrenia already offer some grounds for expecting there not to be a single neural locus of self and self-consciousness. At a first pass, then, we ought to be wary of the view that the conscious self is physically unitary in the strong sense implied by the doctrine of the unity of consciousness. On a view like this, self-consciousness clearly comes out as multi-track, and the changes in sense of agency associated with schizophrenia as failures of integration among distinct self-representing regions, probably caused by their temporal disconnection. But if phenomenal consciousness, and self-consciousness, in particular, are multi-track, what is one to make of the impression most of us have of being a single, integrated subject? Or, to put it more tendentiously: How does a self emerge from the multiplicity of consciousness? This is a difficult question, largely because there are several senses in which one might claim to be a "single subject." Without entering into that murky territory here, we can offer one relatively straightforward answer that is consistent with the multi-track model of consciousness: a self emerges when the multiple tracks of self-directed experience produced by the brain are sufficiently representationally coherent. Representational coherence concerns the way the various contents of experience relate to each other. In normal circumstances we don‘t experience a ―blooming, buzzing confusion‖, but a structured world of discrete objects arrayed in space, a world in which events unfold in a regular, law-like way, and in which informational contents fall into meaningful spatiotemporal patterns. This registration of contents, which is both intra-modal (e.g., colour and form) and inter-modal (e.g., the registration of proprioceptive, auditory and visual contents as one types on a keyboard), also occurs at the level of specifically self-directed representations. Thus, I typically recognise an action as mine as I perform it, am aware of how it fits with my plans, and discover how it affect things about me (and vice versa), all in a real-time, rapidly up-dated feedback cycle. Representational coherence is not an invariable feature of conscious experience—it is a hard-won computational achievement, as demonstrated by the many cases (often the result of trauma) in which the brain fails to produce an integrated model of the world. The emergence of a self therefore presumably depends on some mechanism that acts to bring the multiple, locally generated contents of conscious experience into register with one another. In particular, such a mechanism must render coherent the multiple streams of self-representation upon which so much of our behaviour depends. A promising manoeuvre for the multi-track theorist is to appropriate one of the neural mechanisms/processes that single-track theorists deploy to explain the production of consciousness, and redeploy it in the new role of explaining the brain‘s construction of a self. For example, the multi-track theorist might focus on the ERTAS as a neural structure likely to be involved in global communication and integration, as does Baars, but treat it as a self-maker, rather than a consciousness-maker. If we adopt this proposal then it is possible to regard instantaneous consciousness as a multiplicity, rather than a unity, and yet still claim that it is "unified." The sense in which consciousness is "unified" is not a matter of oneness, but a matter of representational coherence. Such coherence, perhaps courtesy of the ERTAS (cortico-cortical circuits may play a role too), goes some way towards explaining how a self emerges from the multiple strands of representational activity in the brain. This proposal is attractive in the current context because it is reasonable to conjecture that schizophrenia is a disease which impairs the capacity of consciousness-making mechanisms to produce a coherent set of experiences. Instead, possibly as a result of desynchronisation, these mechanisms operate in an autonomous fashion, producing experiences whose contents are disconnected and discontinuous with one another. This gives rise to the familiar symptoms of schizophrenia. In the case of delusions of thought insertion, for example, it is precisely because one part of the brain generates a thought that is representationally discontinuous with mental contents being produced elsewhere that the patient judges it to be alien, and hence disowns it. What we see here is a partial disintegration of the self, but not in the sense of the self failing to be a single thing—on the multi-track view it was never that in the first place—rather, in the sense that the many self-directed representations produced by the brain no longer hang together as a coherent system. We finish with a word of caution. Although representational coherence may play a pivotal role in the emergence of our sense of agency, it is not clear that it can account for what we earlier termed our "sense of subjectivity." Schizophrenics and others who suffer quite radical breakdowns in the connectedness and continuity of their experience generally have no doubt that these anomalous experiences belong to them (see above). The representational incoherence of the parts of experience doesn‘t appear to undermine the phenomenal "togetherness" that characterises a single subject of experience. A multi-track theorist must therefore appeal to a different set of resources to account for this feature of consciousness. One possibility is that such subject unity depends on some feature of brain organization more basic than that which is responsible for representational coherence. For example, the very causal connectedness of the brain as a whole, which is such that a signal can pass from any part of the brain to any other via no more than half a dozen synapses, might be the physical basis of subject unity—even under conditions where representational coherence has broken down. The detailed working out of this proposal is, however, a task we must leave for another time. 1. There is evidence, however, that many of the delusions classified as verbal hallucinations are much closer in their phenomenology to thought insertion. See Graham & Stephens 1994, pp.94-97. 2. The distinction between subjectivity and agency is nicely developed in Graham & Stephens 1994. 3. See McGurk & MacDonald 1976. We owe this example to Tim Bayne. For Bayne‘s critique of the multi-track model, and our reply, see Bayne 2000 and O‘Brien & Opie 2000, respectively. 5. See, for example, Damasio 1999. 6. We use the word ‗sufficiently‘ in this characterisation advisedly, since it renders selfhood a matter of degree. We regard this as a strength of the proposal. Normal integration of colour and form to produce coherent objects is initially absent here. Schizophrenia likewise results from an inability to integrate distinct informational contents, but at the level of self-consciousness, such that self-initiated actions or thoughts fail to be recognised as one‘s own. Baars, B.J. 1997. In the Theater of Consciousness: The Workspace of the Mind. Oxford University Press. Bartels, A. & Zeki, S. 1998. The theory of multi-stage integration in the visual brain. Proc. R. Soc. Lond. B 265: 2327-32. Bayne, T. 2000. The unity of consciousness: Clarification and defence. Australasian Journal of Philosophy 78: 248-54. Cleghorn, J. M. & Albert, M. L. 1990. Modular disjunction in schizophrenia: A framework for a pathological psychophysiology. In A. Kales, C. N. Stefanis & J. Talbot (eds.) Recent Advances in Schizophrenia, Springer Verlag. Damasio, A. 1989. Time-locked multiregional retroactivation: A systems-level proposal for the neural substrate of recall and recognition. Cognition 33: 25-62. Damasio, A. 1999. The Feeling of What Happens: Body and Emotion in the Making of Consciousness. Harcourt Brace. Frith, C., Rees, G. & Friston, K. 1998. Psychosis and the experience of self. Annals of the New York Academy of Sciences 843: 170-8. Georgieff, N. & Jeannerod, M. 1998. Beyond consciousness of external reality: A who system for consciousness of action and self-consciousness. Consciousness and Cognition 7: 465-77. Graham, G. & Stephens, G.L. 1994. Mind and mine. In G. Graham & G. L. Stephens (eds.) Philosophical Psychopathology. MIT Press. Johnstone, E. C. 1991. Defining characteristic of schizophrenia. British Journal of Psychiatry Suppl. (13): 5-6. Liddle, P. F. 1987. The symptoms of chronic schizophrenia: A re-examination of the positive-negative dichotomy. British Journal of Psychiatry 151:145-51. McGurk, H. & MacDonald, J. 1976. Hearing lips and seeing voices. Nature 264: 746-48. Mellors, C. S. 1970. First-rank symptoms of schizophrenia. British Journal of Psychiatry 117:15-23. O‘Brien, G. & Opie, J. 1998. The disunity of consciousness. Australasian Journal of Philosophy 76: 378-95. O‘Brien, G. & Opie, J. 2000. Disunity defended: A reply to Bayne. Australasian Journal of Philosophy 78: 255-63. Penrose, R. 1989. The Emperor’s New Mind. Penguin. Sacks, O. 1995. An Anthropologist On Mars. Picador. Searle, J. 2000. Consciousness. Annual Review of Neuroscience 23: 557-78. Smythies, J.R. 1994: Requiem for the Identity Theory. Inquiry 37: 311-29. Zeki, S. 1993. A Vision of the Brain. Oxford: Blackwell. Zeki, S. & Bartels, A. 1998. The asynchrony of consciousness. Proceedings of the Royal Society, London, B 265: 1583-5.